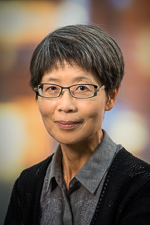 Dr. Zhou is an associate professor of pathology at the University of Utah School of Medicine. She received her medical degree from Fujian Medical College of China, where she also completed an MS in endocrinology. Subsequently, Dr. Zhou completed a research fellowship in endocrinology at the University of Maine, and both an AP/CP residency and a pediatric pathology fellowship at New York University. She is board certified by the American Board of Pathology in both anatomic and clinical pathology and pediatric pathology. Dr. Zhou is a member of the United States and Canadian Academy of Pathology and the Society for Pediatric Pathology. Her research interests include pediatric bone and soft tissue tumors.